From week 20's Dynamo vs. Dong Ji match - Anything can happen in the MAFL. For the Immortals, they will clinch a playoff spot regardless of whether they win or lose but the outcome will determine their playoff seed. Win and they earn the 3rd seed. Lose to Al’amal and they will drop to the fourth seed as Al’amal will have the edge in a tiebreaker between the two, having gone 2 – 1 over the Immortals in head to head play. If the Immortals end up tied with the Dynamo at the end of the regular season, the tiebreaker goes to the Immortals who own a 2 -1 record over the Dynamo in head to head play. Best Case Scenario for Al’amal – Just Win Baby! A victory over the Immortals in Week 21 will clinch them a playoff spot. Lose and Al’amal is out. Best Case Scenario for the Dynamo – Al’amal needs to lose to the Immortals. Regardless of whether the Dynamo win or lose, a tie situation between Al’amal and the Dynamo results in the Dynamo winning the tiebreaker as they went 2 – 1 over Al’amal in regular head to head season play. 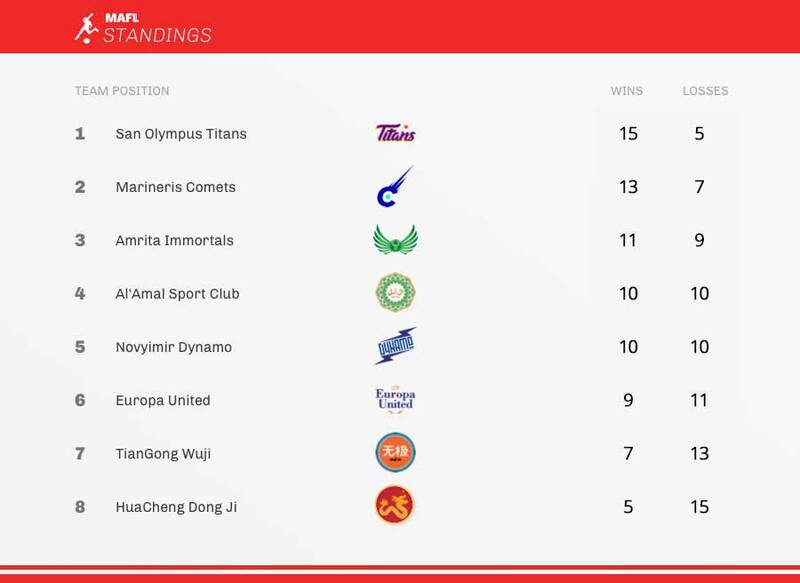 If the Dynamo win and Al’amal wins, we end up with a three way tie for 3rd spot as the Immortals, Al’amal and Dynamo will all own an identical 11 – 10 record. In this three way dance, there’s a standoff. · The Immortals lose to Al’amal in the tiebreaker but go over the Dynamo in a tiebreaker. · Al’amal loses the tiebreaker to the Dynamo but goes over the Immortals in a tiebreaker. · The Dynamo go over Al’amal in the tiebreaker but not over the Immortals in a tiebreaker. Confused? The chart below may help. So to resolve this standoff, we go to Goals Scored. In this case, Al’amal has the edge with 31 goals for the season, then the Immortals with 27 goals, and then the Dynamo with 21 goals. Al’amal goes in 3rd and the Immortals go in 4th. The Dynamos go home. When week 21 resumes, Day 1 will open with the Dynamo hosting Wuji. 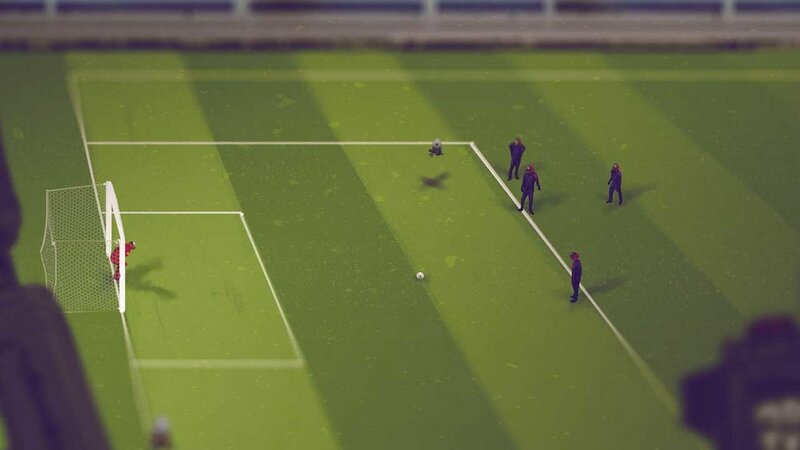 “We can’t control what Al’amal will do, but we can control what we do,” said Dynamos Captain Ilya Petrovich.” For our final game, we want to give our fans something special, so we plan on going out as a winner”. The 2nd match of Day 1 will see the Immortals host Al’amal who go in without 4 of its key players due to injuries. “We know what we need to do”, said Al’amal Captain Mussadiq Baddour. “We can’t take the Immortals for granted as they won’t lie down for us just because they already have a playoff spot clinched”. Immortals Captain Uday Lanka assured reporters they would not be complacent heading into the final game of the season, “We don’t want to drop down to the 4th seed. In the playoffs, you don’t know what will happen so having the possibility of home field advantage down the road is crucial”.